OS Grid Reference: SO 40475 24302. In St Nicholas’ churchyard (north-side near the door) at Grosmont in Monmouthshire, Wales, there was a medieval preaching cross which had crudely carved depictions of Christ crucified and Mary the Virgin with baby Jesus. It was locally called Jack o’ Kent’s Cross. There was, and still is, some uncertainty about the age of the cross, but the carved section atop the shaft was thought to date from between the 11th to 13th century, whereas the shaft and eight-sided base are more recent, maybe 14 or 15th century? Due to ‘the recent safety concerns’ the carved fragment of the cross-head has had to be placed in the church, leaving the shaft and base out in the churchyard. Apparently the shaft was originally much taller. There may have been an earlier cross-head on top of the cross shaft. The 13th century parish church of St Nicholas at Grosmont looks rather like a small cathedral with its tall 14th century octagonal spire, which is a landmark for many miles around. It is to be found at the southwest side of the village, be-side the B4347 road, a couple of miles south of Kentchurch and about 6 miles to the northeast of Llanfihangel Crucorney. Carved cross head at St Nicholas’ church, Grosmont. Today, however, the churchyard cross looks rather forlorn with its chopped down shaft, but it still stands here on its octagonal base – alas though without the carved cross-head. But ‘this’ carved section is safe and secure in the south transept of St Nicholas’ church after it was stolen some years back. We don’t know with any certainty the age of the carved cross-head or where it came from: the thinking being that it is was perhaps carved between the 11th and 13th centuries, whereas the shaft and base are from the 14th or 15th century? with some damage caused to the shaft in the 16th. 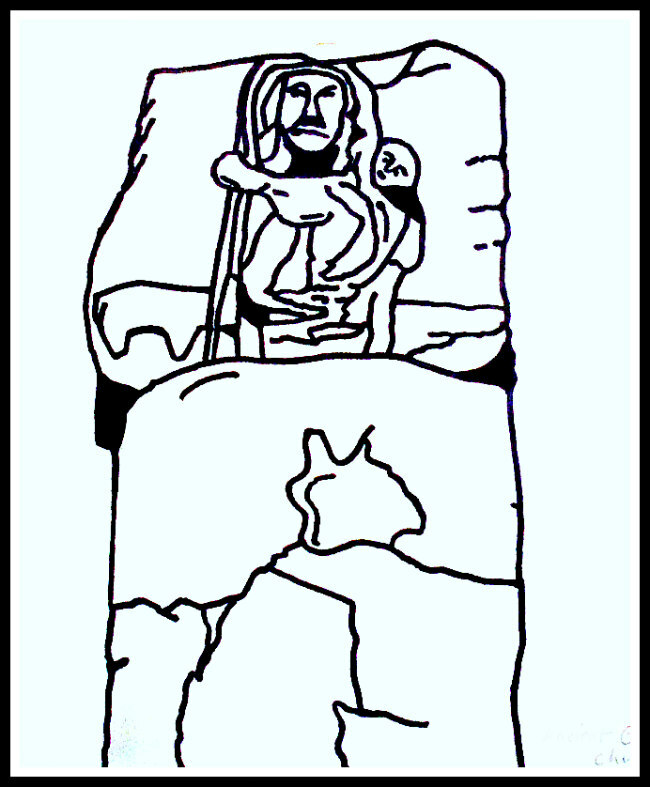 Could the carved section have come from a castle, an abbey, or some other church; that we don’t know, or do we* The carved section, now in the church, shows Christ crucified on one side and Mary and baby Jesus on the other with what could be the outline of a bovine animal lower down; the carving of Mary and Jesus seems to be ‘a crude affair’ compared to that on the opposite face suggesting, perhaps, that it was carved at a different date? It was probably a preaching or wayside cross. 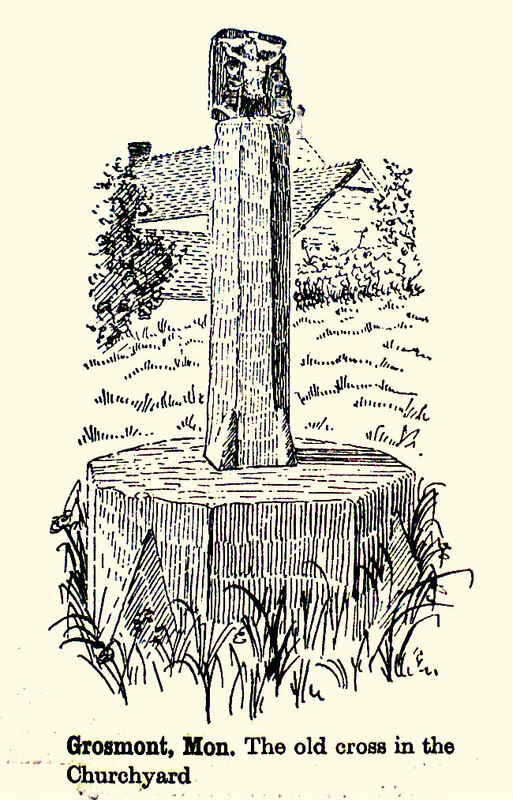 Locally, it is sometimes called ‘Jack o’ Kent’s Cross – after the giant and magician who lived at Kentchurch Court. He was not, however, buried beneath the cross. In fact, Jack’s body was buried only just outside Grosmont church! Chris Barber (1984) tells us more about the church. He says: “Go into the church and you will immediately feel an atmosphere of antiquity, peace and mustiness. The floor of the now disused nave is well illustrated with engraved stones and there are many interesting tablets to read on the walls. In a corner of the nave can be seen a wooden chest known as the ‘”Grosmont Hutch”‘ and a half finished effigy of a knight, which is reputed to be that of Jack o’ Kent who once resided in this corner of Gwent. Numerous stories are told about his deeds and adventures. Some claimed that he was Owain Glyndwr in disguise. ; others accused him of being a wizard in league with the devil. A legend tells that Jack made a pact with Satan that he should have his soul when he died, whether he was buried inside the church or outside. However, Jack cunningly fooled the devil by arranging for his burial to take place under the very walls of the church at Grosmont, so that he was neither inside nor outside. An old tombstone in the churchyard close to the east wall is said to cover his remains and it is claimed that he died at the age of 120 years. A proverb once used in this neighbourhood would describe someone “‘as clever as the devil or Jack of Kent”‘. Barber, Chris, The Seven Hills Of Abergavenny, Blorenge Books, Abergavenny, Gwent, 1992. Barber, Chris, Exploring Gwent — A Walker’s Guide To Gwent Land Of History And Legend, Regional Publications (Bristol) Limited, Clifton, Bristol, 1984. Cross Ash School, Churches And Castles — Within the Grosmont Skenfrith and White Castle Trilateral, 1985. Gregory, Donald, Country Churchyards In Wales, Gwasg Carreg Gwalch, Capel Garmon, Llanrwst, Gwynedd, Wales, 1991. The Church In Wales, Great Churches in the Diocese of Monmouth — a Visitors Guide (Transl. by Sian Edwards), June 2005. Categories: Ancient Churches / Chapels, Ancient Crosses | Tags: Churchyard Cross at St Nicholas' Church at Grosmont in Monmouthshire Wales | Permalink. We mentioned this Jack legend in The Megalithic Empire, surmising that the church at Grosmont had formerly been a ‘signpost’ site. And it turned out to be on a main east-west route. The legend is of course hardly ‘local’, Jack being arguably the most popular name in folklore and, in this case, Kent shows this one’s reach (the route can still be traced despite modern road networks and ends up, as indicated, at the Kent coast). How many Norman and medieval churches are on earlier Megalithic sites has never been properly analysed but perhaps you have more information on this?